Three days of weaving camaraderie. Three days of figuring out unfamiliar drafts and different looms. Three days of decoding weaving theory. Three days with well-known weaving teacher and writer, Madelyn Van der Hoogt. Our guild hosted Madelyn for a three-day workshop on Deflected Doubleweave for Flat and Collapse Fabrics last weekend. Some of us in the workshop have been weaving for years; some for only months. But the drafts challenged and delighted us all as we saw threads go from rectilinear on the loom, to curvy and lumpy after washing. We each threaded a loom in an assigned draft with fine merino wool, cotton, or a wool/silk blend. Some of the drafts were sett very wide to give the yarn room to move in the finishing process. The warps looked dramatically different from what the final fabric looked like. We each wove the first sample, cut it off, and washed it to see what the fabric would do. My draft used a fine wool with a 10/2 mercerized cotton. 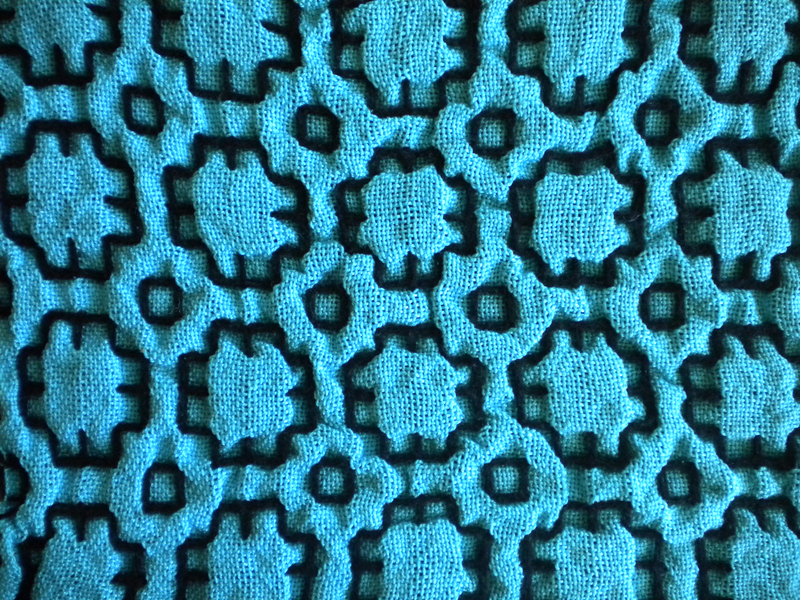 The wool shrunk, of course, which pulled the cotton areas together in puffy figures across the surface; fun! During the course of the weekend, we wove samples on each other’s looms and came away with 16 different examples of yarns doing strange things. 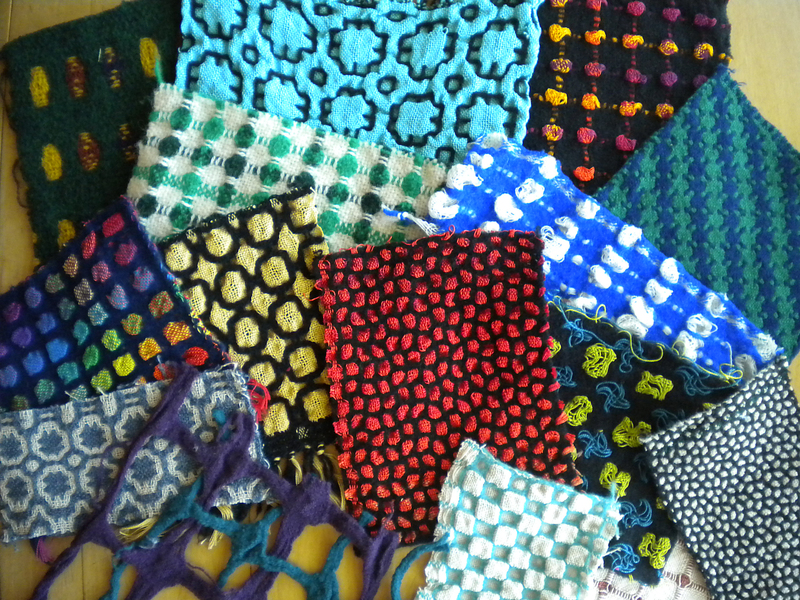 There were samples that looked like mosaics, lacy samples, and polka dot samples. Over and over, we heard to weave square. On some drafts, this meant to barely set the weft in. On other drafts, a normal beat was needed. The trick was to adjust my beat as I moved from a lacy sample to a firm sample. I didn’t always make the adjustment and my samples show it. In between weaving, Madelyn taught weaving theory—comparing what the threads were actually doing structurally versus what the design looked like. Doubleweave is two independent surfaces connected in some way. It is usually threaded dark-light-dark-light, thread by thread. With four shafts, you can weave light on top and dark on bottom or vice versa. As you use more shafts, you can weave more blocks. 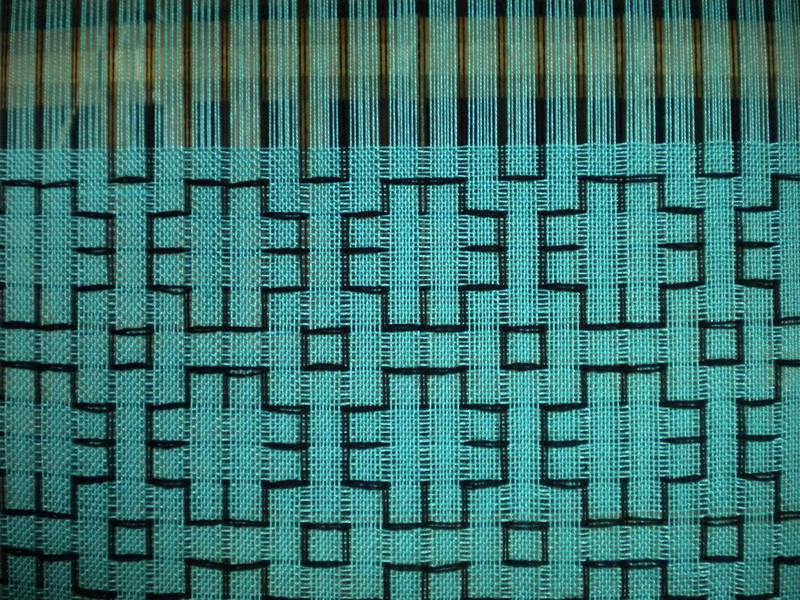 Deflected doubleweave is a block weave; groups of threads from one surface alternate with groups of threads from the other surface. While a drawdown will show you that you have a group of dark threads weaving plain weave over a group of light threads, that drawdown doesn’t show you that because of the sett and floats, those dark threads will slide over the light threads. And the fiber you choose can dramatically change the look of the design. Whether you choose a shrinking yarn for blocks A and C or for blocks B and D will determine whether you get circles, squares, or something entirely different. At the end of the third day, we took the warps off our looms, washed them to get the threads to do their “thing”, and passed out everyone’s samples. We discussed what worked, what didn’t and what we could try to get a different result. What a treat to listen to Madelyn’s stories and explanations of what the threads are actually doing in relation to what they look like they are doing. This isn’t as easy to grasp as it might seem. She admits it. She laughs about trying to put all this into words. That makes us feel better about not “getting it” all the time. At the end of the workshop, we left with more than just samples. Madelyn gave us much food for thought and inspiration for further exploration. I wish I was an experienced enough weaver to really understand all this. I wish I had a weaving guild in my area. Sigh–what a fascinating-sounding workshop! It was a fascinating workshop. It’s fun to see what people will come up with when playing with threads!There are on-line study groups with organizations like Complex Weavers, but nothing beats getting together with other weavers to hash things through. Looks like an amazing workshop. I’ve had trouble with weaving sq to get the desired effect on some deflected DW’s.